Two of my biggest frustrations with tank car kits have been with keeping the running boards and handrails straight and in alignment. These kits are designed so the running boards drop into the end castings, thus eliminating the waviness found in one piece assemblies. Also the handrail stanchion holes are pre-drilled, eliminating that fussy chore. 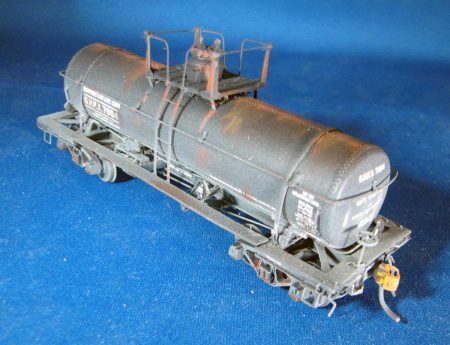 The tank and underframe are built as separate assemblies, to be joined late in the construction process. These kits come with one size fits all instructions, as has often been seen in other resin kits, and there are extra parts in the kits to cover prototype variations. The difference here, however, is a chart in the instructions that clearly shows which parts are used for each car number series. This, along with very clear and well marked photos greatly helps in sorting things out. The chart clearly identifies variations in various fittings for each car series and the commodities that each prototype carried. I found very little ambiguity in the ten pages of instructions. 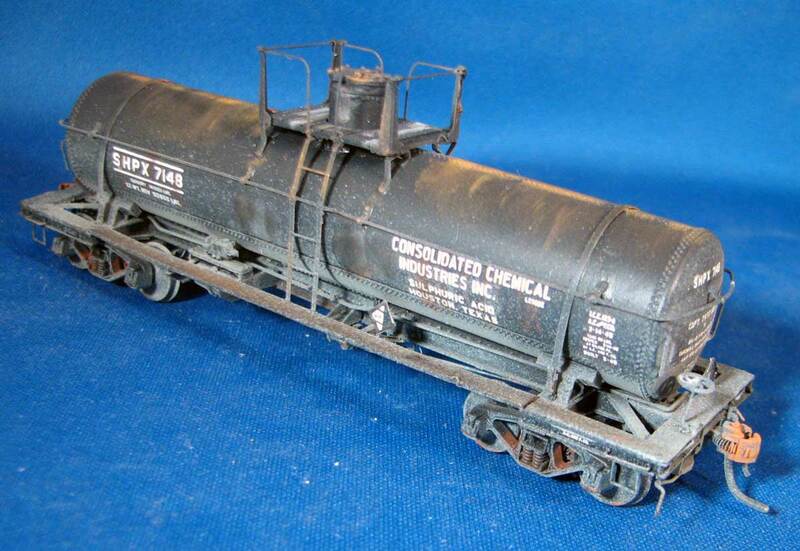 There are helpful prototype photos on the last page and additional photos on the page of extras on the RCW website. Still, these are kits that by their very nature require a considerable amount of time to build. There are many parts and assemblies involved but none are particularly difficult. Etched metal parts are provided for the dome platform which aid considerably in building the delicate-looking assembly. The tank bands are also etchings and designed so they are very easy to fit tightly around the tank. 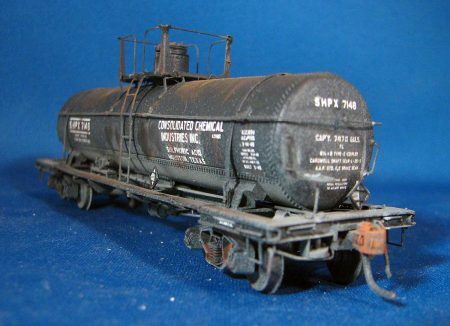 This has often been another point of frustration in other tank car kits I have built. I really enjoyed building these two cars. They made me feel as though I really built something and not just assemble something. These are not kits for the beginner and they provide just enough of a challenge to the experienced builder to be very satisfying. These cars were built closely following the kit instructions. 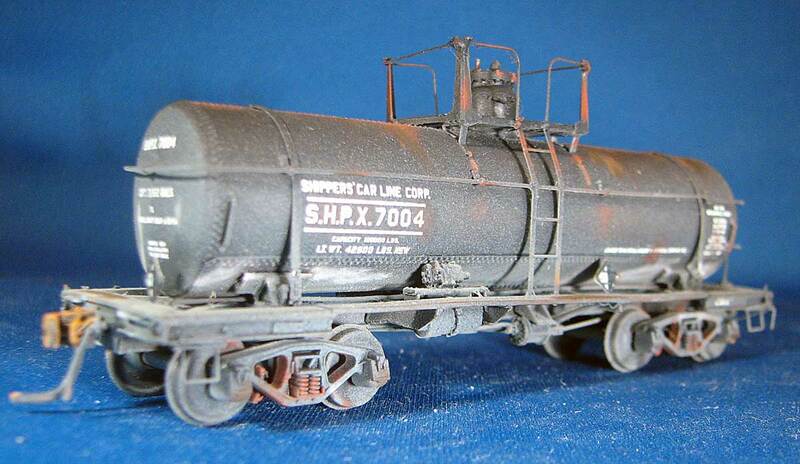 SHPX 7004 is the 7k gallon kit, while SHPX 7148 is the 8k. I finished these with Scalecoat Engine Black and weathered them with Scalecoat Flat Grime and Pan Pastels. The trucks are Tahoe Model Works Barber S-2’s. 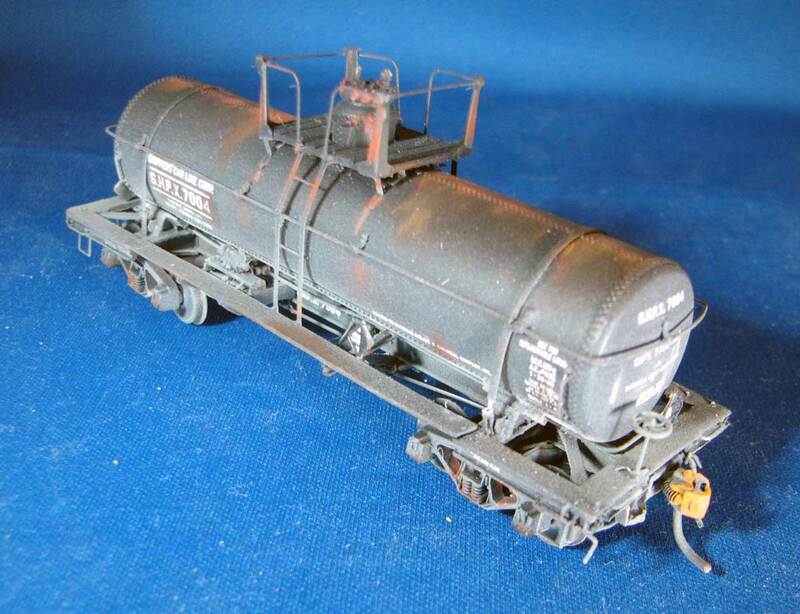 Thank you Jim for sharing your work on these two Resin Car Works acid tank car kits. Questions and comments can be posted below. Please follow the instructions so your comment can be posted. All comments are reviewed and approved before they appear. To subscribe to this blog, enter your info for a comment and check the last box to notify of new posts by email.